The Common Security and Defense Policy (CSDP) of the European Union (EU) epitomises an unparalleled institutional effort on the part of EU member states to offer a comprehensive response to global security risks. The CSDP, unlike most of EU’s supranational policies, remains exclusively under the competence of EU member states, issues pertaining to the high-politics realm of security and defense being still considered as top priorities to national sovereignty. In his Foreword to the book Explaining the EU’s Common Security and Defense Policy. Theory in action (Kurowska & Breuer, 2012), Javier Solana, the former EU High Representative for the Common Foreign and Security Policy (CFSP), rightly described the CSDP’s capacity building for crisis management as being indeed “unparalleled”. He further mentioned the unique characteristics of the CSDP, with a diverse and complex array of crisis management instruments, management structures, and civilian and military capabilities that complement member states’ traditional foreign and security tools. According to Javier Solana, the CSDP’s uniqueness and fast development, since it was first set in motion with the declaration of St. Malo in December 1998, has prompted numerous academic responses and research inquiries focused on the CSDP’s creation and structural innovations. 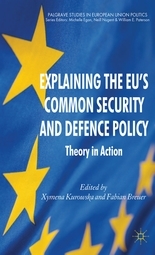 The Palgrave Studies in European Union Politics Series book project, Explaining the EU’s Common Security and Defense Policy Theory in action, proposed by the editors Xymena Kurowska and Fabian Breuer, answers the above-mentioned needs to deeper analyse and reflect on the CSDP’s distinctiveness. By bringing together leading researchers from the fields of International Relations and Security Studies and their respective theoretical perspectives and original empirical examinations, this book offers a sophisticated review of the EU’s international security role and sheds further light on different aspects of CSDP structures and policy innovations. The contributing scholars generate a comprehensive, yet easy-to-follow, overview of the major theoretical debates in the field, the academic pluralism guiding the book project being reflected in the chapters arrangement: from mainstream theoretical approaches (neorealism, neo-liberal institutionalism, strategic studies, sociological institutionalism), more marginal ones (consistent constructivism, structural constructivism), to critical analyses (neo-Marxism, Foucault and Bourdieu-inspired research). The importance given to both theoretical pluralism and grounded theoretical inquiry is accounted for by the need in the CSDP scholarship to construct diversified conceptual apparatuses that have an applied, more practice-oriented theoretical relevance. The theoretical end goal of the book is to problematise the two dominant debates in European Studies literature that guided the first wave of CSDP research: the normative power Europe literature and the Europeanisation literature focusing on normative power projection (Kurowska &Breuer, 2012:4). The book falls in the category of theoretical efforts to move the discussion on the CSDP from normative-analytical debates to more systematic and empirically descriptive analyses. As the editors recognise, the CSDP is particularly under-theorised, a “second wave” (Kurowska &Breuer, 2012:2) of academic literature on the CSDP being called for in terms of research design and theory building. Regarding the academic scholarship produced concerning the CSDP in general, the editors pinpoint a poignant aspect related to the relative closeness between the academic and policy communities (Kurowska &Breuer, 2012:2) that have empirically grounded the analyses in reality. Nevertheless, they further stress the risks of such close engagement by pointing to the increased dangers of scholarly reproducing the normative debates and values of CSDP policy makers. The book advocates for a “theory in action”, encompassing critical distance, research-design reflexivity, and the much needed theoretically-informed empirical insights in the CSDP. The book will prove to be instrumental to both scholars and practitioners by providing a theoretical and empirical compass for those who want to have a deeper understanding of CSDP. This entry was posted on 04/02/2014 by ISIS Europe in Contributors, Raluca Csernatoni, Reviews and tagged CSDP, Defence, EU, EU Foreign Policy, EU security.